I have had this location on my to-shoot list for some time now. I have scoped it out at various times of the day while going to other places but haven't quite found the right time to shoot it. I had decided that an early morning storm coming in from the West with a relatively clear sky to the East would make for a dramatic shot with the mill lit up under foreboding skies. That was the plan, and according to the weather forecast I was very likely going to see just those conditions developing this morning. I got up early so that I could beat the sun out there, so I would have plenty of time to work out a composition before the clouds came in at 8am. When I arrived, there were just some thin clouds in the sky, nothing much at all. I spent some time dialing in my composition, and playing with exposures. I actually got a few really cool shots with a pink sky overhead. Typically, I would have been all over those images, but for this particular subject, the color just didn't work. It needed more muted tones to be successful so I discarded the pink skies. As the sun came up, I started to realize that I wasn't going to have the light show that I wanted, and was expecting. There were still just very small strands of clouds in the sky to work with, so I went with my plan B which I had figured out on the way out to the mill. It was time to do some more work with my 10-Stop ND filter which would reduce the amount of light that entered the camera enough to turn a 1/2 second exposure into 8 minutes. I already had a 3-Stop ND Grad fitted to control the exposure in the sky, so adding an additional 10 stops of light reduction was serious! The picture that leads this story off is the second attempt and represents a full five minutes of exposure at f/18. The clouds show a very nice cottony movement across the sky, and there is even a little bit of color left in them...but not too much. 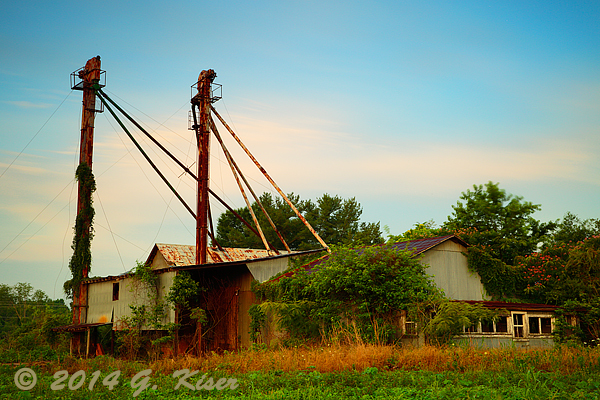 This mill has a sad aura around it, and I wanted to capture an image that represented that. When I looked at the LCD, I wasn't sure if I had gotten it or not, but the sun was coming up fast now, and my exposures were shrinking down into the 30 second realm. I went ahead and moved in close to the old structure and looked for some intimate shots. 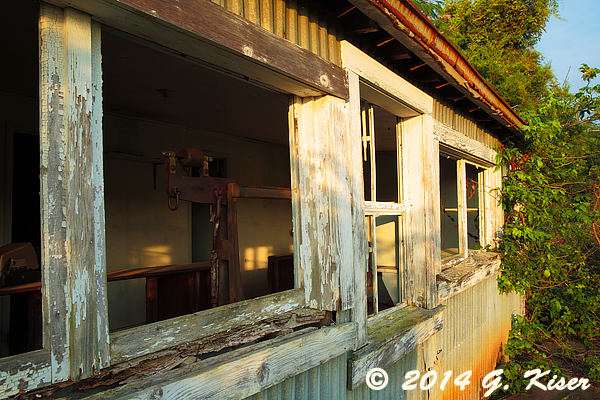 I came across the front area and found that all of the windows were long gone. There were still some tools inside, and there was this one right at the window which caught my eye. With the low sun shining into the building I had enough light to work with so that I could capture this old rusty implement framed in the window. The fact that the window frame was all but completely rotten was an added bonus for me. There wasn't a lot else to work with here at the mill because the sky had gone to a fairly empty blue shortly after sunrise. After making another quick check of the hourly forecast and deciding that my time would be better spent going elsewhere, I decided to pack it up and see what else I could find to put in front of my camera. As an interesting side note, I have been doing a lot of studying on the extreme ND filters and have found that typically their effects are much better rendered in monochrome. 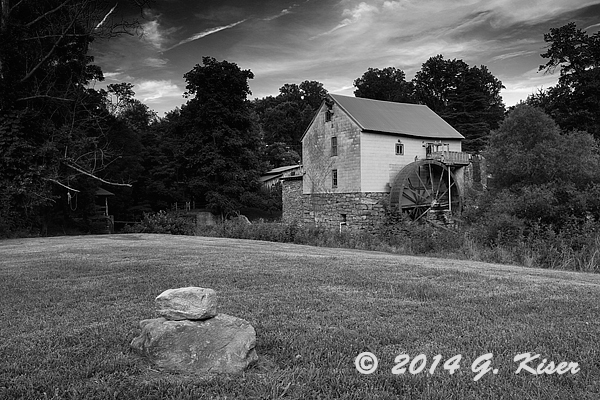 Because of that, I was actively thinking in B&W when I was shooting the old mill. When I got home, I made the conversion with this image and was quite literally shocked at how the sky turned out with the addition of a high contrast red filter with a little bit of subtle tonal tweaks. The clouds even formed a natural vignette in the frame to help keep the eyes where they are supposed to be. I knew I had a winner with this image when I saw it on my screen. I could see this one printed out very large and framed for the house! 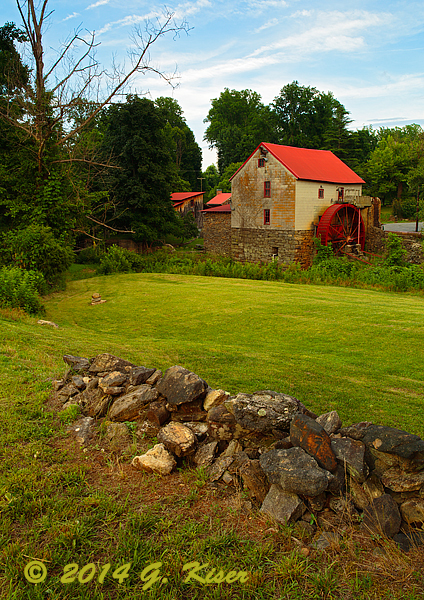 With the mill behind me, I set off on an unguided tour through Yadkin County in search of something else to photograph. 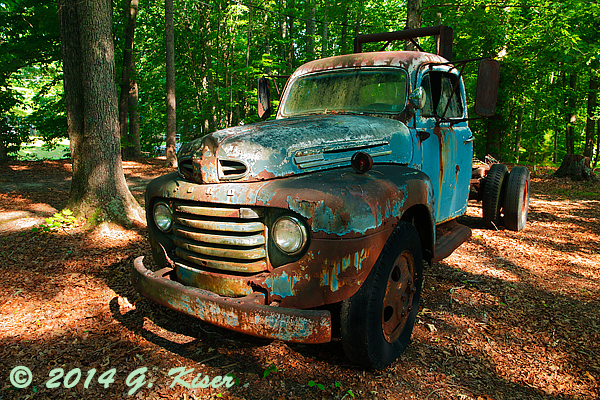 I was still in my rustic mood, so I was looking for barns and old cars to photograph. What I saw wasn't all that promising in the current conditions, and I was starting to wonder if I was going to find anything else before it was time to get home. As luck would have it, my travels landed me back in a familiar part of town where I have been several times before. I knew that there was a car there which has provided me with several stunning images...but these were night shots as there was a lot of clutter in the area. Despite that, I decided to check it out since I was in the neighborhood. 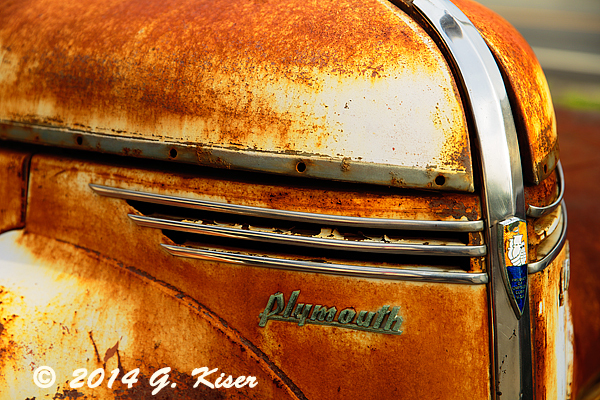 The old Plymouth was still there, and still in the same condition. However, the already tricky location of this car was made much, much worse by the two trucks that were parked close by the car. What's a photographer supposed to do? Well fortunately, there was another vintage Chrysler parked on the back side of the lot, and there was only one other car parked next to it. As you can tell, this one wasn't in the best position either. It was worth a try though since last time I wasn't able to shoot it since I was working in the dark, and black just doesn't show up well at night. In order to capture this car the right way, without including the other car beside it, I had to get a little creative about angles, and focal length choices. 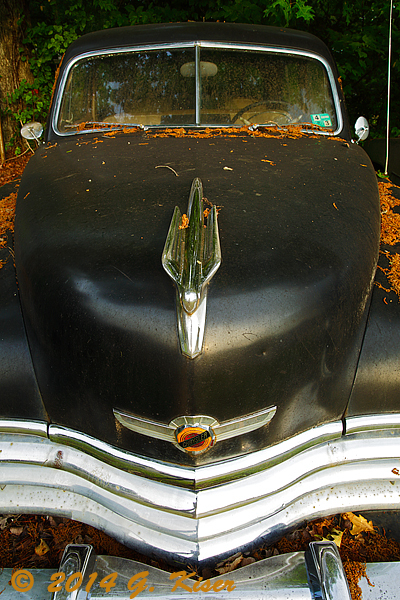 I still had my 24-70mm lens attached, and decided that it would work fine for what I was going to have to do in order to photograph this old sedan. 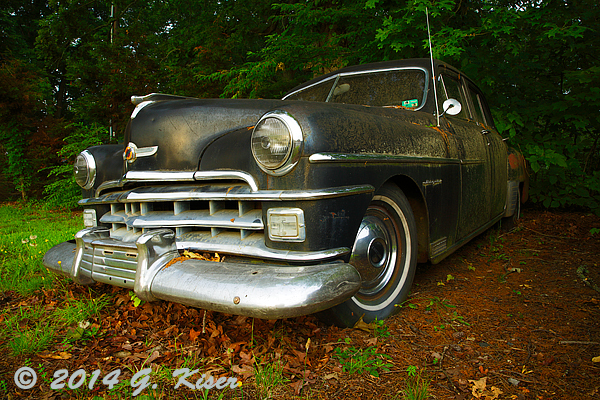 I added a polarizer to help control the glare, and I went to work on the Chrysler. What you see here is not a product of visual trickery with Photoshop. I didn't make the neighboring car disappear at all. I just got in close and chose a wide angle to keep the right edge of the frame skirting down the side of the car I didn't want included. 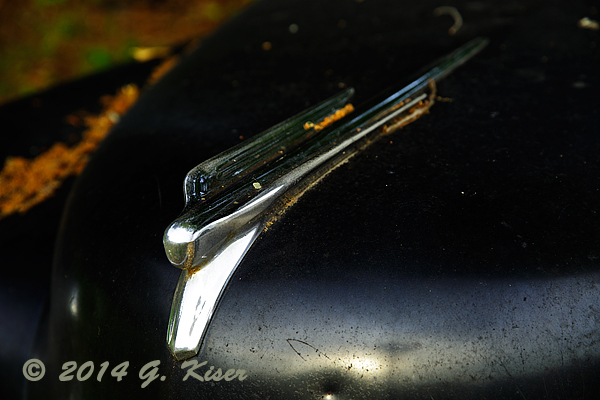 I also got down low to emphasize the grill which I though was the focal point of the car, and what told the best story. When you have an understanding of the camera, and the lenses, you can avoid many of the problems that you come across in the field at the time of the shot, as opposed to waiting until you get home to clone things out, and crop your frame. 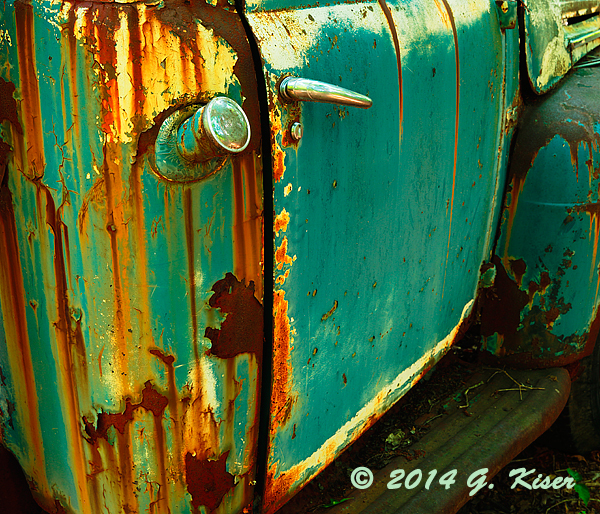 If you have been following me recently, you will already know that I enjoy photographing the fronts of cars. 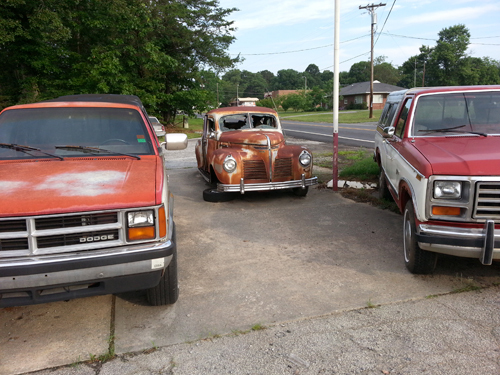 I like the grills, emblems, and hood ornaments. 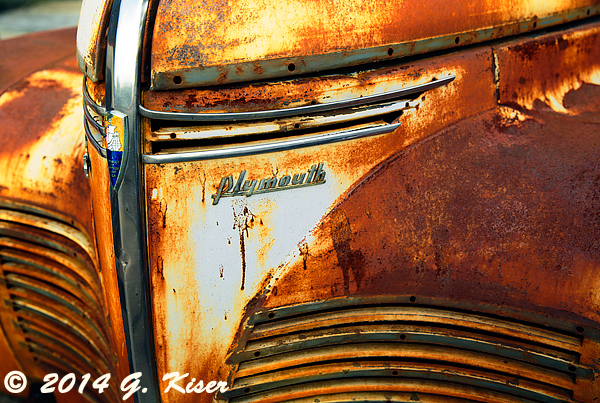 This Chrysler had it all, and the shapes and textures of it all begged to be photographed. I flipped the camera on its side and got in close to capture the essence of this car. 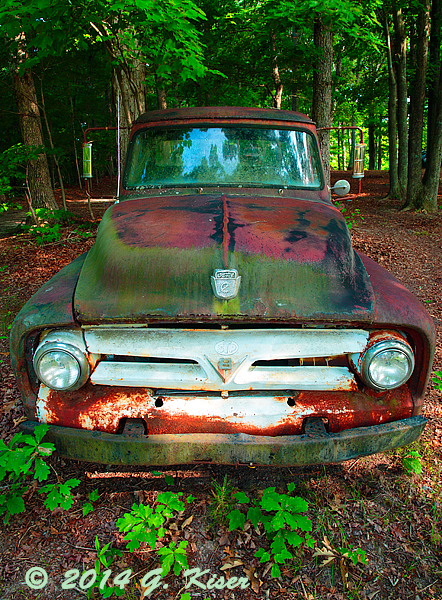 While things still shine, the debris from the trees really leaves no question that this once proud car has seen the last of its passengers...at least for now. After working the available angles on the Chrysler, I decided to have another go at the Plymouth sitting beside the street. 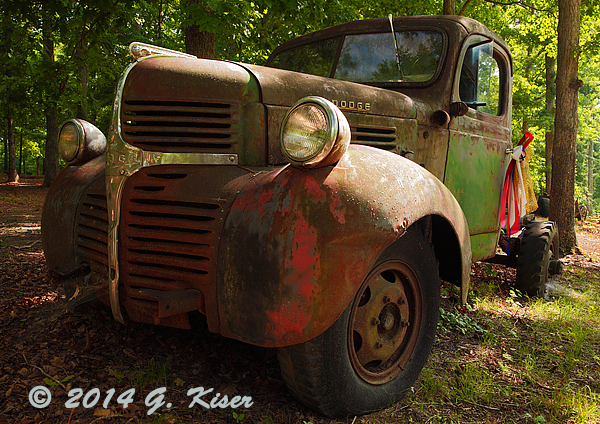 The location of this car makes for difficult photography all by itself, but today I had two trucks which were added to the mix that were guaranteed to make things much more difficult that I had planned. 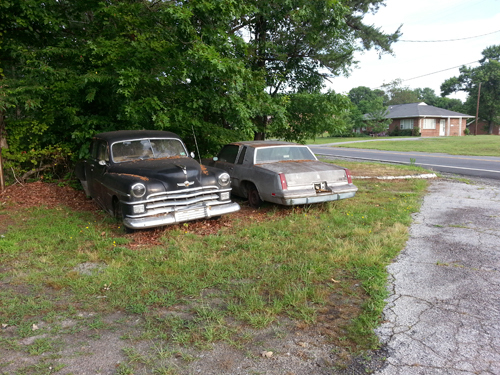 After having such success with the black car, I was feeling pretty confident about this rusty sedan. When I just can't shoot the whole car, what else am I supposed to do other than pick out the parts of the car I really like. The nose of this one has stayed in my mind since the first time I saw it. For a completely un-aerodynamic profile, the curves and lines of this car are nothing short of sensuous. It was that essence I worked so long to capture. 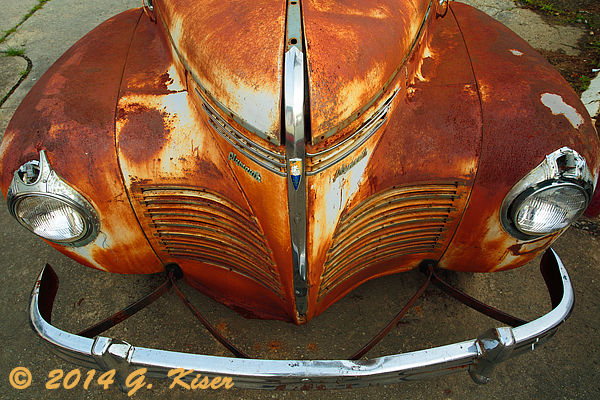 I eventually found myself in a zen state and I was finding angle after angle to showcase the workmanship and lines of this old car. I could probably shoot the angles on this car all day long without getting tired...and from the looks of it, I did spend quite a bit of time working the front end of this car. There is just something about this car that I just can't get enough of. 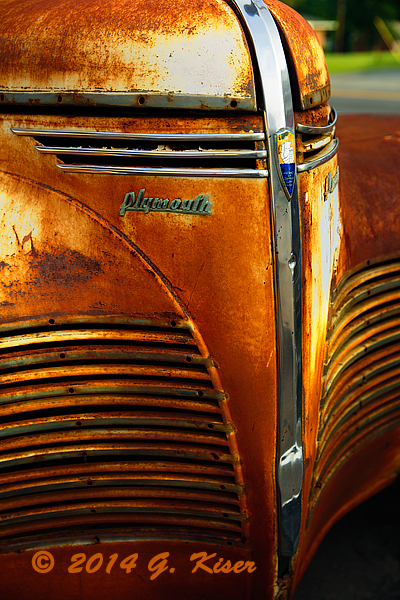 The patina is very unique and rather uniform over the entire car. While it is missing pretty much everything, it still seems like a complete car. This car still has a personality, and I glad that I have the opportunity to capture it. After nearly an hour in the lot, it was time to head home and get my (responsible) day started. I had about 60 images from the morning, and I'm pleased to say that I have 10 images that I would consider keepers from this set. This is much better than the three or four I was expecting as I was actually pressing the shutter button. Now I just need to see which of these images will make it into the gallery rooms here. It has been too long since I have been out Trekking. I suppose I have a good excuse though. You see, I was sick pretty much my entire time off last week. I had no energy, and a temperature of 101+ so I was pretty much grounded from going out of the house. I didn't mind one bit though because every time I tried to get up, I would feel like collapsing. I was quite content staying and home and letting Toni take care of me. This week is a good bit different though. 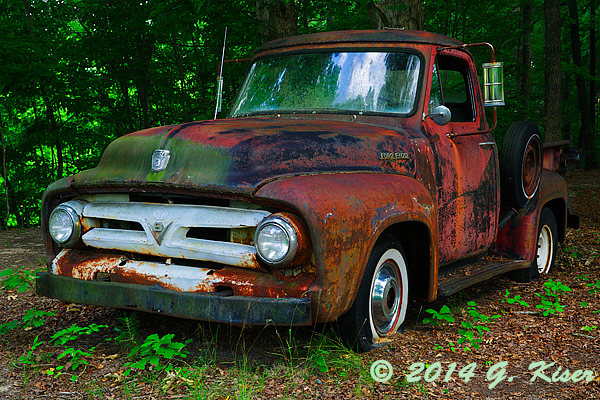 I am feeling much better and am in need of getting out and doing some photography. The plan for this morning was to go up to the mountains and work a couple of waterfalls in Little Switzerland. That plan fell through when I looked at the weather and the cloud cover that I needed was non-existent. I rolled back over and went back to sleep. All day I was paying attention to the clouds and watching them come and go in various formations and intensities. I have been eyeballing the Guilford Mill for some time now, but knew I needed a sky with blue in it, but not too much to make my vision work out. At dinner time, the sky was pretty much a blank white canvas and I was all set to call it a day and start fresh tomorrow with something else that I had in mind. However, as we were finishing dinner, I could see some potential in the sky, and thought that I had better go out and give it a try. As I was driving, the textures in the sky started to minimize, and I was losing my much needed backdrop for the old mill. I didn't give up though, I just kept plowing on to my destination. I went ahead and pulled the camera out with the 24-70mm lens still attached. I added a polarizer to boost the colors and take some of the glare off of the metal roof. I started to compose my first shot and quickly realized that the sky was just too bright without having the sun lighting the mill. My only choice was to fit my Lee filter system and start adding some ND Grad filters to even out the exposures. That was the trick that I needed, and from that point on, I was able to get some very balanced exposures which was not the easiest thing to do under these conditions. I found my favorite compositions by the rock wall on the far side of the field. With the very soft light I was able to get all sorts of detail in the wall. 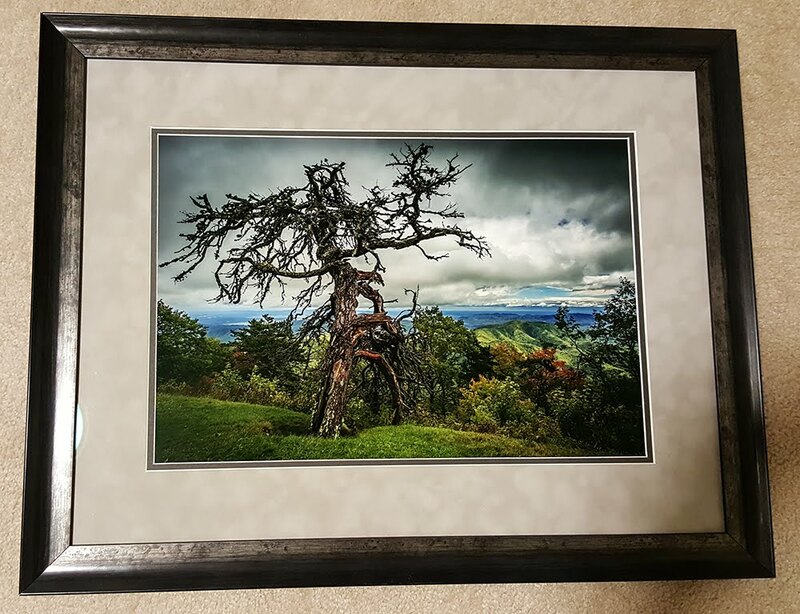 The dead tree, with its bare limbs on the left made for a very fitting natural frame to the composition as well. 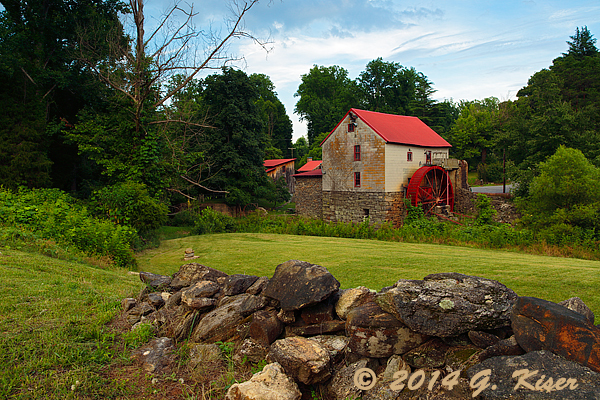 While this is a working grist mill to this day, there was a feel of decay here today. Maybe it was the shrouded sun, or the time of day...whatever it was, I was tapping into the somber mood with my photographs. These are a far cry from my first attempts at this location back in 2005 when I went in the middle of the day and shot under a full sun. I still remember going out there on that early March day. It was the second time I had gone out with my brand new Sony F828. I knew very little about lighting as you can tell. This picture is actually kind of hard to look at because of the harsh line between light and dark. 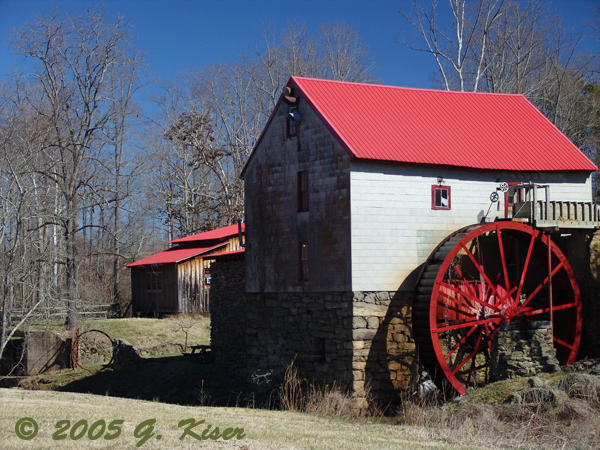 You can see that the mill has aged a good bit in nine years, but still looks the same. Its one of the more photographed places in Guilford County I would imagine, but it does hold a certain warm spot in my heart. It was the setting for interview with Roy's Folks back in 2010. You can view the full piece in the About the Photographer section. What do I do when Toni goes to work, and Sierra is at a friend's house for the evening? I go Trekking, of course! I went out more out of convenience than for weather conditions for once. Its rare that I get the opportunity to go out for a late afternoon/evening Trek so I had to jump on this one. The question was....where to go? Looking at the weather, it was pretty much the same across NC, partly cloudy skies with a chance of a thunderstorm toward the evening. Looking at the hourly forecasts for the mountains I saw a slight chance of getting the right mix of clouds to do another waterfall or two. 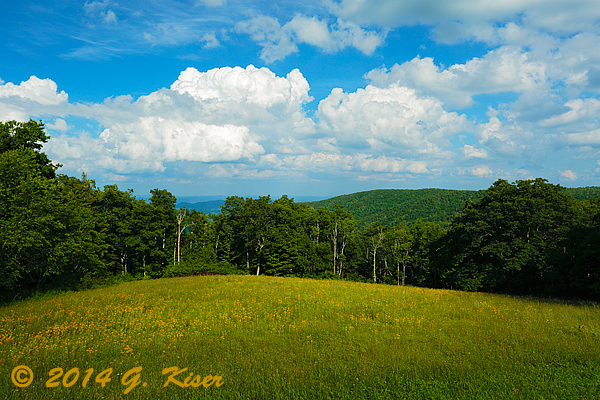 If that didn't pan out, I was thinking I had enough cloud cover to do some grand landscapes instead. In order to keep both of those options open until the last minute, I opted to head out to the Blue Ridge Parkway, and aim toward the section near the Pisgah National Forest. I left in the early afternoon which would put me on the Parkway with plenty of time to decide whether I would be shooting waterfalls or landscapes. As I drove down the highway I was watching the sky. The clouds seemed to all be behind me, with very little up ahead. Oh well, I still had some distance to cover, hopefully the clouds would meet me up there. 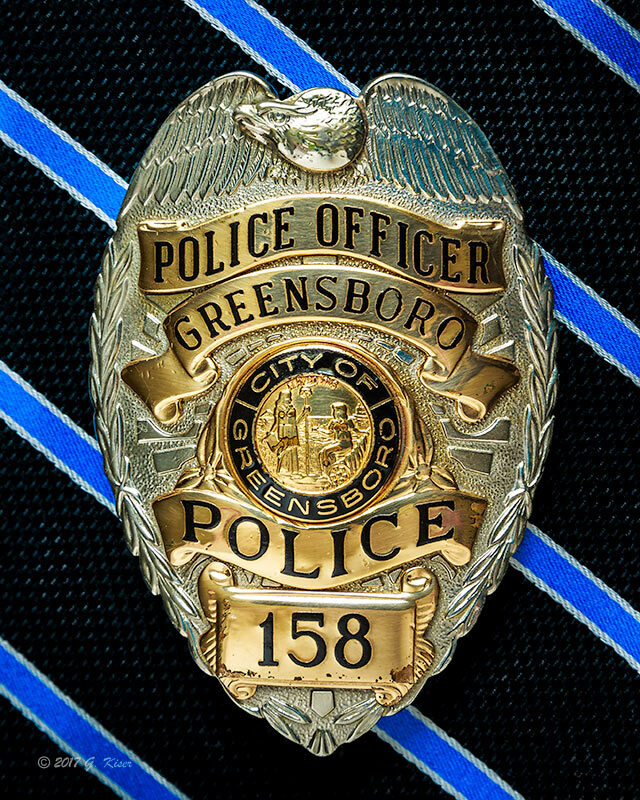 As I made my way through Wilkesboro the clouds were starting to build up a little bit and I started to get excited. The clouds were not all that puffy, just large. I was starting to think that I would get my waterfall shoot in after all. I made the final decision to turn South from US 421 which had several waterfalls to choose from. The grand landscapes weren't all that great in this section, but I would have some to play with if the clouds changed up. By the time I got to the Linn Cove Viaduct, I was doubting that the clouds would let me work with waterfalls, and strangely enough, even though the clouds looked great in the sky, the overall lighting quality was not all that great. I couldn't quite put my hand on it, but things that should look good right now, weren't. As I drove across the Viaduct, I saw a section of the mountains with another bridge span that I wanted to photograph. I wasn't able to get out on the Viaduct, but I knew that there was a trail that snaked along underneath of it that I had been on before. I decided to give that trail a quick hike to see what vantage points it offered. 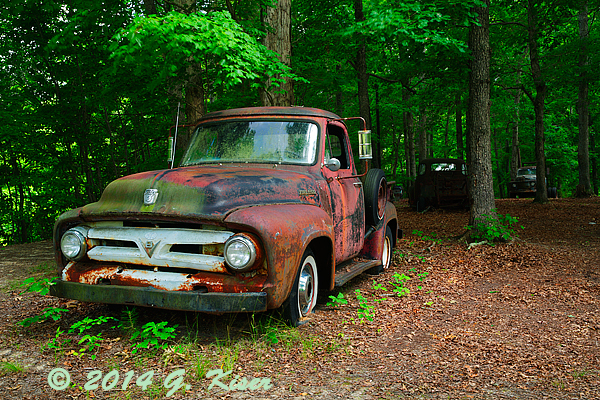 I was a little disappointed at what I found along the trail as far as places I could shoot the opposing mountain side. I could see it, but I couldn't get in position to capture it as I wanted. I did notice that the side of the mountain that I was on was completely cloaked in shadows. 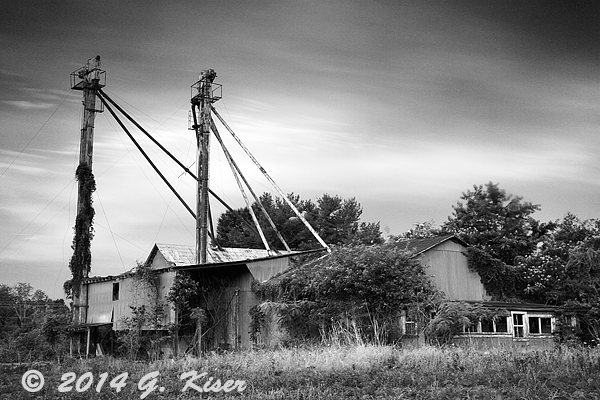 This made it possible to do a little bit of work with some intimate landscapes. It just so happened that there were several trees with some incredible root systems right off of the trail, near the parking lot. I started to work with one of these and fit my 70-200mm lens, along with an enhancing polarizer to pick out the detail of the root system along with a pop of fresh green at its base. It only took three frames before I found the right composition that had the best flow of elements. The quality of light was still a little bit off, and everything had a strange green appearance that I was hoping to be able to counteract with some tweaking of the color temperature settings. When I am working with these intimate landscapes, I start to look at them as an abstract rather than a straight photograph. It becomes all about design and texture when I am working close in. In this picture, the actual trail snakes between the rocks, and on the left rock there are two trees that have roots that have overlapped and followed the rock until they found the nourishment of the ground. 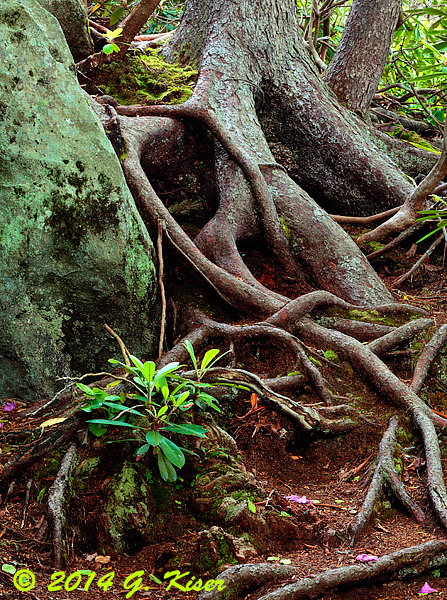 Even some other hikers stopped and made comments about how these roots looked. They were absolutely worth a few frames, but I found it very difficult to compose a picture that made visual sense, even in the abstract realm. 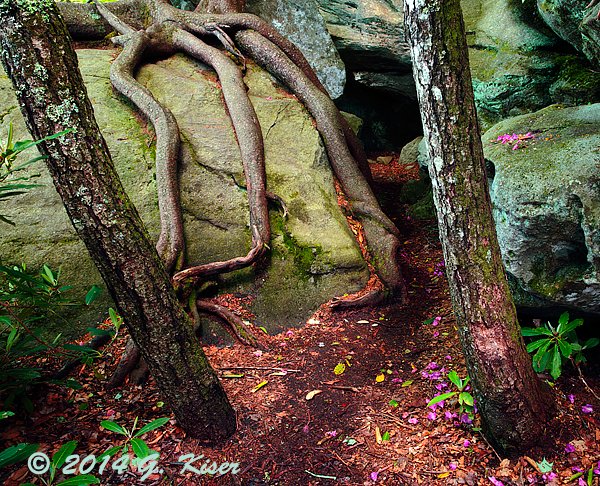 There were two trees that were growing right at the entrance to the "cave" that seemed to get in the way of pretty much every composition I tried. Even when I tried to incorporate them into the composition, it still didn't feel all that logical to me. When it was all said and done though, I found the overlapping root system too interesting to pass up. With the help of my 24-70mm lens, I was able to embrace the two trees and capture the above composition. I was quickly realizing that there were no good vantage points to see the distant mountains in this section of the Blue Ridge Parkway. The drive was pretty, and I was enjoying the fresh air, but I wanted to see some wide open vistas with what was left of the clouds above it. Apparently that was too tall of an order because I saw nothing like that at all. I did decide to pull into the Lost Cove Cliffs overlook because I could see a good ways in the distance. I was a little disappointed in what I saw there. There was not much of an overlook at all, but there were a couple of elements that I did find interesting. First, there was a field of Golden Rods which caught my eye, and a single tree off to the side that was equally as interesting. I almost passed it up, but I could hear Toni telling me to get out and give it a try. With my 24-70mm still attached, I composed a simple "postcard" shot of the overlook. The colors were interesting, and helped to give it a visual warmth. The clouds above were a wonderful addition as well. However, looking at the LCD this image lacked that visual punch that I wanted from this location. I decided that I was going to need to get down in the field of flowers and shoot them up close and personal before I would get that visual impact that I was after. To really make this effective, I swapped out my lens and fit my 16-35mm super wide angle because this was going to be a perfect shot for that glass. As I got down low into the field, I could see that my visual pop was finally there in my photograph. I had bright and vibrant color, depth, and that wonderful sky above. I just had to watch out for my shadow since the sun was coming from my right rear, and I was casting a long shadow to the left which was picked up easily by the super wide angle lens. However, I was in a perfect location to see very good effects from the the polarizer since I was at nearly 90* to the sun. I worked on several different compositions, and found myself getting in closer and closer to the white daisies that were sporadically present in the field. It wasn't until I flipped the camera that it all really came together for me though. 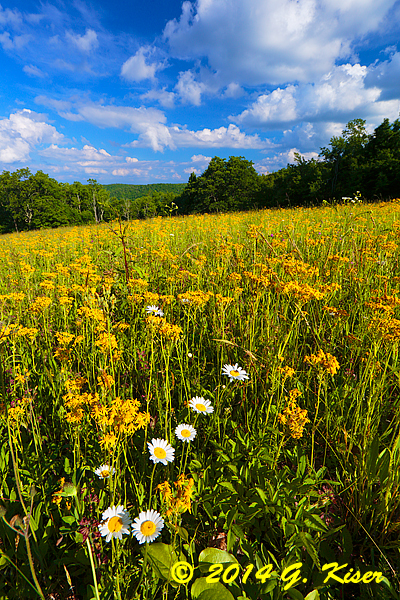 I was lucky enough to find a grouping of flowers that formed an almost straight line that I could place in the foreground of this composition. Just in case I thought that I had the wrong group, there was a small insect that was sunning itself on the last flower in the line. Just another little detail that made this a very fun picture to capture. The sky developed as almost three dimensional with the shading and perspective. All of the colors worked together so well, and everything just flowed with this picture. I was pretty sure that I had found my favorite composition of the day right here in this obscure little overlook. I had a smile on my face, and was feeling better about the rest of the Trek now. When I had exhausted my compositions in the field, I went back to work with the tree that was standing on the side of the field all alone. One thing that Toni has taught me in photography is that trees make some excellent subjects no matter if they are alive, dead, full of leaves, or completely bare. When I see an interesting tree, I always stop and give it a second or third look to see if I can do it justice with the camera. One thing that I didn't care much for with this tree was that there was a large branch that had broken off and found itself hung up on one of the branches on the right side of the tree. This made photographing the tree in its entirety a little impractical. I also couldn't get it at the angle that would show the distant mountains like I was wanting to do. 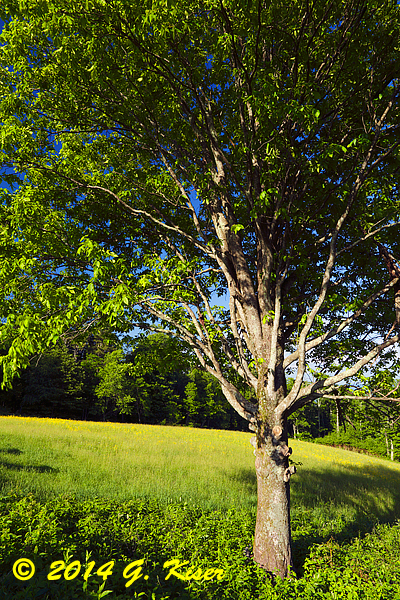 My choices were slim, but the tree was talking to me, so I kept working with it. I still had my 16-35mm lens attached and figured that it would give me the correct perspective of the tree, and help to illustrate the size of it. While setting up the shot, I realized another problem with this angle....my clouds were almost all gone from this part of the sky. I wasn't going to be able to shoot the composition I was aiming for, but instead decided to get in a little closer to put the spotlight on the trunk and use the leaves to fill the upper portion of the frame with color that would balance to the ground. You can still see bits of that brilliant blue in the sky above, but the vast majority of the visual weight in this image belongs to the tree and that was exactly what I was hoping for. After being at this sight for about 30 minutes, it was time to move on and try to find something different. The sky still had a good deal of interest in it, but the quality of light was hit and miss depending on what direction I was wanting to shoot from. As I drove, nothing really jumped out at me, and I made the decision that when I was wanting to do grand landscapes it was probably best to avoid this section. It is rich with other things, but grand views are really lacking. It was starting to get a little late and I figured that I had better start looking for a sunset location, or something that would benefit from a low sun to the West. I abandoned my Southerly direction and turned around to head back where I came from. I didn't really have a destination in mind, but had thought about working Price Lake a little bit with my 10-Stop ND Filter. As it turned out, I didn't pass anything at all of interest before I got to Price Lake. Well, I guess I'll just go ahead and get out and see what I can see. I did a quick hike around the lake because I knew of an old stump that was sticking out of the water. I found it, but the lighting was all wrong with it. the stump was in the deep shadows, and there wasn't much behind it that was interesting. I gave up on that pretty quick knowing that the light was fading fast. I found a bench next to a pretty cool tree that I spent a little time photographing, but never found a composition that I liked. I was keeping an eye on the sky, and found that the clouds were moving back in, and even better, it appeared as though they were getting bathed in a nice golden light from the setting sun. I sped up my retreat from the trail and worked my way back to the actual lake. When I got to the parking area and boat launch, I could see that the clouds over the lake were starting to light up very nicely, and the far coastline was also getting a nice share of the warm light. I wasn't sure where I could set up to photograph this the best, but I decided to get down to the water level and search out something that I could use as a foreground interest. Oddly enough, I had parked next to a staircase, and I was looking for a way down so I took it. Once at the water level, I found a large rock with some grasses growing beside of it. I figured that this would be as good as anything else. I set the camera up, and left the 24-70mm lens attached, but added my filter holder and got out a selection of ND Grads to take advantage of the reflection in the water. After several exposures I could see a lot of potential in this location, but the composition wasn't working for me. I wasn't quite sure what it was, but decided that I needed the perspective from my 16-35mm lens to make this work. I swapped the lens out, and kept the filter system in place at the front. I was using multiple combinations of filters to balance the exposure of the rock, reflection, and sky in order to get a properly exposed image. I love working with live view when doing landscape photography. I was able to dial everything in using the histogram and check the visual impact of the composition with one glance. I moved the filters in place in their holder until I got the right combination of exposure across the frame. I cranked off several frames from various locations, but found that the rock fit into the natural curve of the distant shore best at this position. There was also a good deal of waiting on the clouds to get into position within the frame to keep the visual weight where I wanted it to be. All in all, when I was processing the images at the end of the day, this sunset image over the lake quickly eclipsed Lazy Dazy as my favorite image of the day. This is the second time that I was able to stay up on the Blue Ridge Parkway for a sunset where that last composition of the day turned out to be my favorite from the whole Trek. Even more interesting, neither of these sunset images I am talking about were planned. In both cases, they were just the locations that I was close to, and I lucked up reading the sky, and finding a location that worked for the landscape. 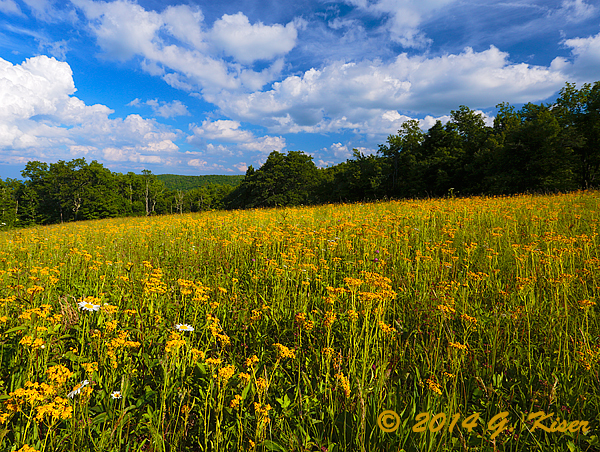 Now, I just have to decide which of these new images will make the cut and end up in my Landscapes Room. Today's trek actually started over the winter while I was driving around the local stomping grounds trying to find some good subjects to photograph. If I remember correctly, there were very little clouds in the sky, and I was focusing mainly on scouting locations. 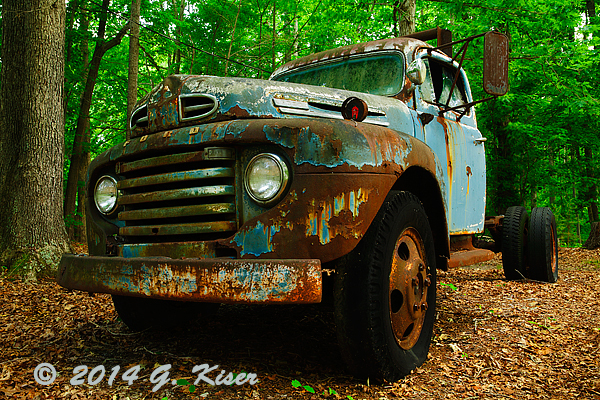 I managed to find several possible subjects in Southeastern Forsyth County near Union Cross Rd. There was a barn tucked back in an overgrown field on one side of a school and another barn set off to the side of a field on the other side of the school. Both were interesting and I filed them away in my memory for another time. In March, I went back out during an overcast morning to shoot the one barn that would allow me to have some diffused front lighting. This shoot went well, but there were some lighting difficulties to deal with. The sky was pretty much a blank slate of white. That meant that I was not going to even attempt the other barn which would include quite a bit of sky no matter what composition I was to use. 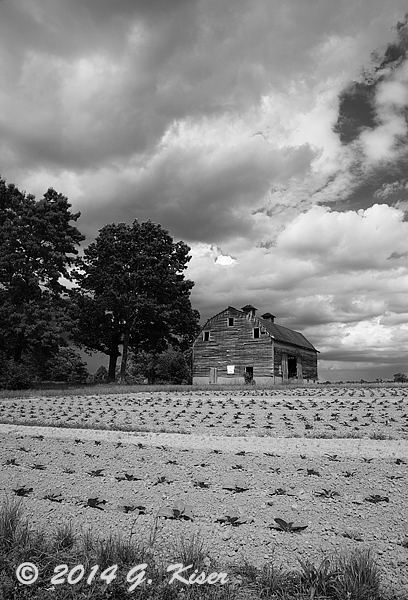 Since then, I have driven by that barn under many different weather conditions, and have determined that I needed to go out in the afternoon when the sun would be at my back, providing some front lighting, with some very dense, and textured clouds overhead. Essentially, I was going to need to find a storm front to come through during a very small window of time. I wasn't asking for much....not much at all. When I arrived at the barn, everything was pretty much flat when it came to the lighting. The clouds were perfect, and there were even some fresh crops growing. I could see some breaks in the clouds, but nothing where the sun was. I could see the glow of the sun, and at least I knew it was in the right position for what I wanted to work with. I made the decision to go ahead and get things set up and find a composition that worked in hopes that the sky would open up long enough to snap some pictures. 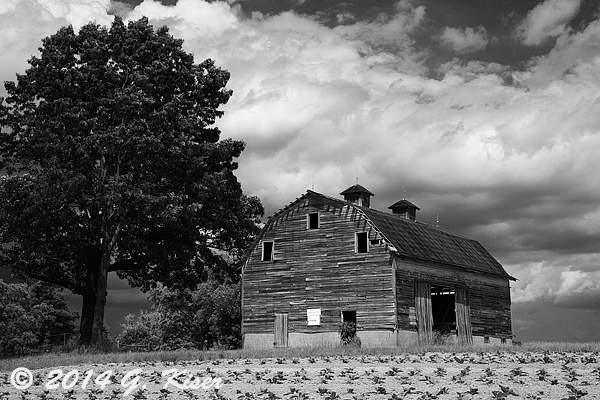 Composition was going to be difficult with this barn. There was a solid metal shed to the left in the tree line. There was nothing but wide open field to the right, and behind the barn was the top of a church, as well as a couple of houses in the background. None of this did I want to include in my composition because I wanted to focus on the barn, and possibly the crops that helped to tell the story of the barn. This meant that I was going to need to shoot low to keep the other buildings below the slight ridge that the barn was built on. I was also going to have to find a visual balance between the visual weight of the trees to the left and the nothing to the right. All of these constraints left me with only one choice for a lens which was a benefit. I was going to need my 24-70mm which would give me a wide enough angle of view without being so wide as to include the metal shed to the left. 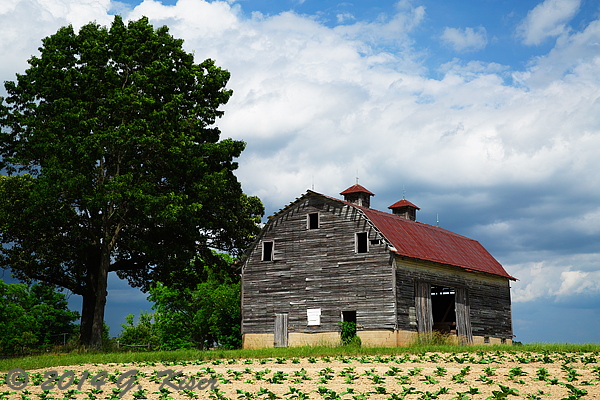 Looking at the colors involved, I decided that using an enhancing polarizer would also be a good choice as it would deepen the blue sky, as well as the colors of the barn. Normally, I would want to use an ND Grad to help control the sky, but there was no good division point on the horizon that would allow me to apply the filter with any benefit. That was my need for the sun at my back...it was going to bring out the detail in the foreground and in the barn while I was able to keep the exposure correct for the sky. This is exactly what I mean when I talk about previsualization! 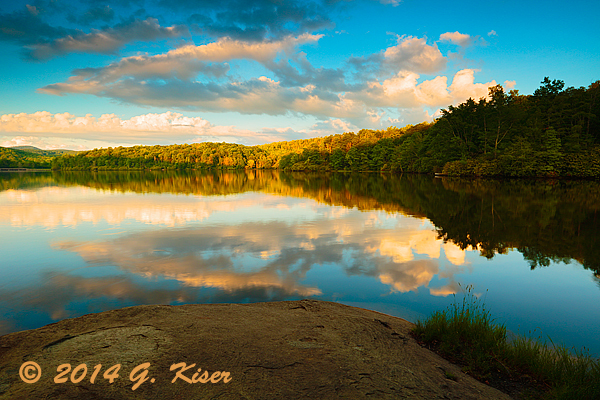 Because of the layout of the elements, I was able to shoot both landscape and portrait modes with success. While the shooting position was within a few feet from one another, the focus of the image as well as the story behind it, changes significantly in my opinion making both compositions stand on their own. In both compositions, its the sky that gives the much needed drama to an otherwise blah scene. I had never seen this barn in these conditions, but I had imagined it many times over in the past few months. Every time clouds started to roll in, I would consider going out to this barn, but I was never given the much needed breaks in the clouds at the right time of the day. Today, I lucked out, and the conditions were perfect. In fact, when I returned home, I told Toni that if the pictures didn't turn out good, it was totally my fault because I was working in nearly perfect lighting conditions. In about 30 minute's time I shot a little over 40 frames with slightly different light qualities due to the passing clouds. I knew that I was over shooting, and that my target of a 10% hit rate was going to fall short since at best, I was going to have only two significantly different compositions. There were just not that many angles to work with because of the environment. However, the clouds were great, and I know from experience that dramatic skies make for really good monochrome conversions. With that in mind, about halfway through the session, I started to really look at things in a B&W frame of mind. I could see how the different tones would work together, and the range of tones that were present. I figured that this would make for a very good candidate for a conversion when I processed them later. When I got done processing the color versions of the two that I liked the best (I was hoping for two and got just that), I decided to back the process up, and reprocess as a monochrome. As I started to play with the tonal relationships, I started to see just what I was seeing in the field, and I became quite excited. The texture in the wood really started to stand out, and the clouds were presented in such an ominous manner I knew I had a winner with the black and white presentation. While I like the intimate nature of the horizontal composition, I can really appreciate the depth of the vertical orientation which includes the rows of crops. It also make for a more dynamic sky in my opinion. Of course, I'm a little biased, so its always nice to get a second opinion from my photo wench....Toni. When presented with all four images as printed proofs, she picked All in a Row in monochrome as her favorite. I find it very hard to argue the point with her, and find myself agreeing the more I look at it.